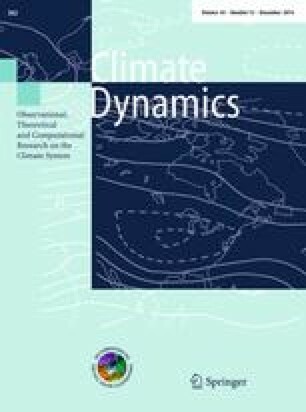 This study proposes an overview of the main synoptic, medium-range and intraseasonal modes of convection and precipitation in northern spring (March–June 1979–2010) over West and Central Africa, and to understand their atmospheric dynamics. It is based on daily National Oceanic and Atmospheric Administration outgoing longwave radiation and Cloud Archive User Service Tb convection data, daily TRMM and Global Precipitation Climatology Project rainfall products and daily ERA-Interim reanalysis atmospheric fields. It is first shown that mesoscale convective systems can be modulated in terms of occurrences number and intensity at such time scales. Based on empirical orthogonal function analyses on the 2–90-day filtered data it is shown that the main mode of convective and rainfall variability is located along the Guinean coast with a moderate to weak extension over Central Africa. Corresponding regressed deseasonalised atmospheric fields highlight an eastward propagation of patterns consistent with convectively coupled equatorial Kelvin wave dynamics. Then a singular spectrum analysis combined with a Hierarchical Ascendant Classification enable to define objectively the main spectral bands of variability within the 2–90-day band, and highlight three main bands, 2–8-, 8–22- and 20–90-day. Within these three bands, space–time spectral decomposition is used to identify the relative impacts of convectively coupled equatorial Kelvin, Rossby and inertia–gravity waves, as well as Madden–Julian Oscillation (MJO) signal. It confirms that eastward propagating signals (convectively coupled equatorial Kelvin wave and MJO) are highly dominant in these convection and precipitation variability modes over the Guinean coast during northern spring. So, while rain-producing individual systems are moving westward, their activity are highly modulated by sub-regional and regional scales envelops moving to the east. This is a burning issue for operational forecasting centers to be able to monitor and predict such eastward propagating envelops of convective activity. We thank the two anonymous reviewers who helped clarifying some parts of this article. We are also thankful to NOAA-CIRES Climate Diagnostics Center (Boulder, CO) for providing the interpolated OLR dataset from their Web site (online at http://www.cdc.noaa.gov/). The leading author thanks IRD for its Ph.D. financial support. This study was supported by the French component of AMMA. Based on French initiative, AMMA was built by an international scientific group and is currently funded by a large number of agencies, especially from France, UK, US and Africa. It has been beneficiary of a major financial contribution from the European Community’s Sixth Framework Research Programme. Detailed information on scientific coordination and funding is available on the AMMA International website http://www.amma-international.org.